In both formal and informal discussions with leaders and parents, I love asking them to name the biggest struggle of young people. Extensive research confirms what leaders and parents are seeing with their own eyes. In one study, 13- to 17-year-olds were more likely to report feeling “extreme stress” than adults. Even more appalling is the gap between teenagers’ anxiety and parents’ recognition of their kids’ stress. Approximately 20 percent of teenagers confess that they worry “a great deal” about current and future life events. But only 8 percent of the parents of these same teenagers are aware that their child is experiencing such stress. Tweet: Approximately 20% of teenagers confess that they worry a great deal about current and future life events. But only 8% of the parents of these same teenagers are aware that their child is experiencing such stress. The roller coaster ride of stress doesn’t end at high school graduation. Chief among young adults’ stressors are those related to “daily life management,” most notably new pressures related to time and money that accompany post-high-school freedom and responsibilities. By middle school, the common rule of thumb in elementary school that a child commits to “one extracurricular activity at a time” feels outdated and too small. So we need different principles that work for teenagers and young adults. Allow me to suggest two new ones for young people (that can also help those of us who are post-30). As your young person matures, it’s time for them to recognize (and abide by) this helpful rule: if they add something new, they probably have to drop something old. It’s developmentally appropriate for young people to begin to bump up against their limitations. They can’t do everything. They can’t be everything. They can’t go everywhere. At first, this seems like a life-limiting reality, but I try to reframe those “no’s” through dialog with our kids about life-giving questions. The questions you ask, and even how you talk about this first rule of thumb, need to shift as your child ages. The type of schedule direction we give to 16-year-olds is inappropriate, if not insulting, to 26-year-olds. Being sensitive to maturing kids’ schedules often means offering fewer suggestions and more questions. If I could change one aspect about my life, I would replace 10-15 percent of my calendar commitments with relaxed downtime with my family. I’m guessing as a parent or leader, you might feel the same. In both my family, as well as with our team at the Fuller Youth Institute, I conducted a six-month experiment of using “definite yes” as a litmus test for whether to pursue a certain activity. Using that criteria was a game changer for my family’s schedule (as well as our team’s focus). Driving my high school son to a weeklong summer school intensive, giving us five hours in the car together? Heavens yes. Definitely yes. Can’t-wait-to-go-yes. You and I, and the young people we know, often live with commitments beyond our control that temper our ability to choose “yes” or “no” for ourselves. An inflexible work schedule, a chronically-ill family member, or extended family obligations can put members of all generations in places where saying “no” feels like an incredible privilege. But many of us do have more choice than we act on. So the next time you’re talking with a busy and stressed teenager or young adult, suggest that they do the same experiment. If six months is too long, maybe they could use this rule of thumb for six weeks. Or even six days. Urge them to try it out, and see what difference it makes. Let’s act by saying “no” when we can. And let’s invite the teenagers and young adults we care about to do the same. Just because our kids are growing up doesn’t mean we give up. Many parents of a teenager or young adult feel as though they’re guessing about what to do next. We want to stay connected with our rapidly-maturing child, but we’re not sure how. And deep down, we might fear our child doesn’t want or need us. 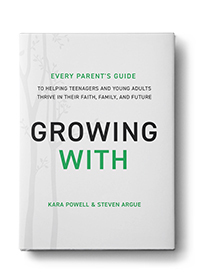 As our kids grow up, we need a new parenting posture that helps us grow together. Growing With can help parents think of new relational challenges as opportunities for our own growth. Filled with brand-new research and stories from remarkable families nationwide, discover three ground-breaking strategies to develop empathy, dive into tough discussions, work towards solutions, and take the next faithful step on a mutual journey of intentional growth that trusts God to transform you and your family. Growing With parenting isn’t about preserving the past or predicting the future. Find out how to cultivate your relationships with your kids where they are today—in real time. American Psychological Association, “American Psychological Association Survey Shows Teen Stress Rivals That of Adults,” http://www.apa.org/news/press/releases/2014/02/teen-stress.aspx. American Psychological Association, “2010 Stress in America Report,” http://www.apa.org/news/press/releases/stress/key-findings.aspx. Sociologist Tim Clydesdale coined the term “daily life management” to describe the daily pressures faced by college students. Tim Clydesdale, The First Year Out (Chicago: University of Chicago Press, 2007), 2. Greg McKeown, Essentialism (New York: Crown Business, 2014), 103.